Do you have any questions for us? Check out our list of frequently asked questions and you’ll surely find the answers. If you don’t see the information you need below, feel free to contact us right away. For reservations in May through October, we require notice 24 hours prior to your date of arrival to cancel with no penalty. November through April reservations can cancel up to the day of arrival by 6 p.m. Call our 24-hour Front Desk team at 231-547-0300. Check-in time begins at 3 p.m. and check-out time is at 11 a.m.
We have a 24-hour indoor pool for your enjoyment. You can take a dip in our indoor hot tub. Yes. All guests receive complimentary Wi-Fi. Yes, we want to help you save on your next stay. Check out our specials and packages here. No, but there are plentiful nearby outdoor options and, based on availability, we offer two complimentary rental bikes during your stay through our bike-share program. We love your furry friends and would be happy to accommodate them in our pet-friendly rooms. The cost is $20 per pet per night. We have a business center with computers, printing services, and free Wi-Fi in our lobby. We offer dry-cleaning services to our guests. We don't offer room service, but we'll happily tell you about local restaurants that deliver. Yes, we offer connecting rooms for your convenience. With a variety of room types to offer, we have varying limits to the people in each room. Generally, our rooms accommodate four to five people. Call the Front Desk to confirm the number of people in your room prior to your arrival so we can advise you specifically on your room type. Yes, we offer accessible rooms and bathrooms with roll-in showers. Yes, we have an elevator for your convenience. No, but they do come with a refrigerator, microwave, and coffeemaker. We also provide Seattle’s Best Coffee. Yes, we offer rollaway beds for the additional charge of $10 per night. We are located in Charlevoix, MI, in the northern lower peninsula. We're within walking distance to Depot Beach and only one mile from Downtown Charlevoix, 14 miles from Petoskey, 47 miles from Traverse City, and 51 miles from Mackinac. We don’t offer any shuttle service. We offer plenty of free on-site parking for our guests! We are located about a 10-minute drive from Charlevoix Municipal Airport and an hour from Cherry Capital Airport in Traverse City. What is the weather like in Charlevoix? Summers are warm and mild. Fall has warm days and cool nights. Some years, the water is warm enough for swimming through September. In winter, snowfall can occur any time between November and April. There's always something fun and exciting going on, and you can find out here. How do I get a quote for a room block for a meeting, event or wedding? You can ask all your wedding and event questions here. How many people can your meeting/event spaces accommodate? Our meeting and event spaces accommodate up to 30 people. We offer affordable group accommodations and group room blocks. We don't have a restaurant or bar, but we're glad to point you in the direction of our local favorites. 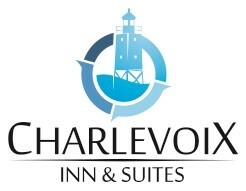 There are a variety of great restaurants and bars in downtown Charlevoix, only one mile away. All guests are welcome to join us for complimentary continental breakfast every morning.